For Those of You Looking to Improve Your Cook - This is it! Pit Bulls "Up In Smoke" Online Cook School is Now Available. 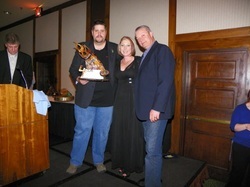 The 2011 competition year brought us even further in our professional standings taking home four Reserve Grand finishes with forty Top 10 category wins and finishing 4th in the Georgia Barbecue Championship (2nd among the 248 GA Teams competing.) 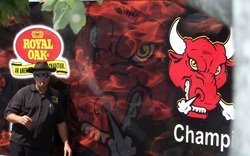 The 2011 competition year also had our team placed in the top 50 professional BBQ teams world-wide out of over 5000 teams (quite an achievement for the team). Just to think, it all started with a stick-burner, a pop-up tent, some hickory wood, some soul, a lot of cold sleepless nights and blazing hot days, oh and lets’ not forget…determination! With all that, we picked up some great sponsorship by Royal Oak Charcoal and Moore’s Marinade and we have been featured numerous times on BBQ Superstars. We are looking forward to making an appearance on Barbecue Pitmaster’s one day soon and are currently working on achieving that goal. Today, we are looking to score big and make our mark on the professional barbecue circuit. 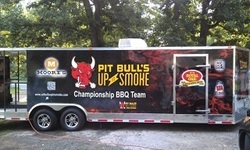 Pit Bulls "Up In Smoke" New Trailer Wrap Completed! Just completed - our new trailer wrap! Terry & Melissa McKay of Custom Graphics & Signs out of Okeechobee, FL completed & installed our custom trailer wrap and it is awesome! If you are looking for a company that can handle any job, big or small, then give them a call! They do incredible work at a very fair price. Thank you Terry & Melissa for a job well done! Looking Forward To Another Year in the Royal Oak Family - Truly a Charcoal Made for Champions! 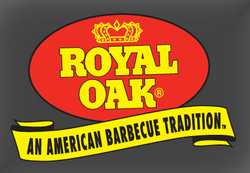 Pit Bulls "Up In Smoke" is proud to announce and say thank you to the continuing support of Royal Oak Charcoal. We look forward to another great year with your fantastic product. In our opinion, it's the best lump charcoal out there for competition 'Que. It keeps temp, doesn't bridge, gets back up to temp rapidly, and produces little ash. It's a great product that we don't leave home without. Thanks again to the Royal Oak family for your support this year! Visit their website at www.royal-oak.com to learn more about their amazing product. 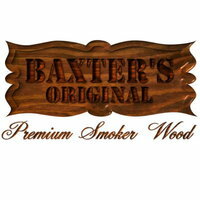 Or you can click here to download a list of nationwide stores that sell Royal Oak Charcoal. Looking Forward To Another Fantastic Year in the Moore's Marinade Family - The Finest Marinades & Sauces Around! Pit Bulls "Up In Smoke" is entering it's second year as a Competition BBQ Cook Team for the Moore's Marinade Family and we are looking forward to another amazing year using your sauces and marinades for competition. It is truly the best marinade around and our Team doesn't leave home with out it. Moore's Marinade is a "Must-Have" for Professional BBQ Competition! 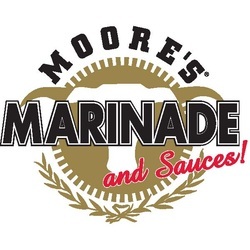 Moore's Original Marinade was introduced fourty years ago at a steakhouse in a small town called Jasper, Alabama (just north of Birmingham). Moore's Marinades are family recipes made with the highest quality ingredients around that enhance food flavors instead of covering them.